This mysterious collection of guitar pieces limped through the door begging for help. Wildcard of Wildcard Guitars checked it out and was asked “What the Hayl is that?” “Should we just turn this into a 6-string guitar”? But the Wildcard noticed that the neck was off center and tipped. 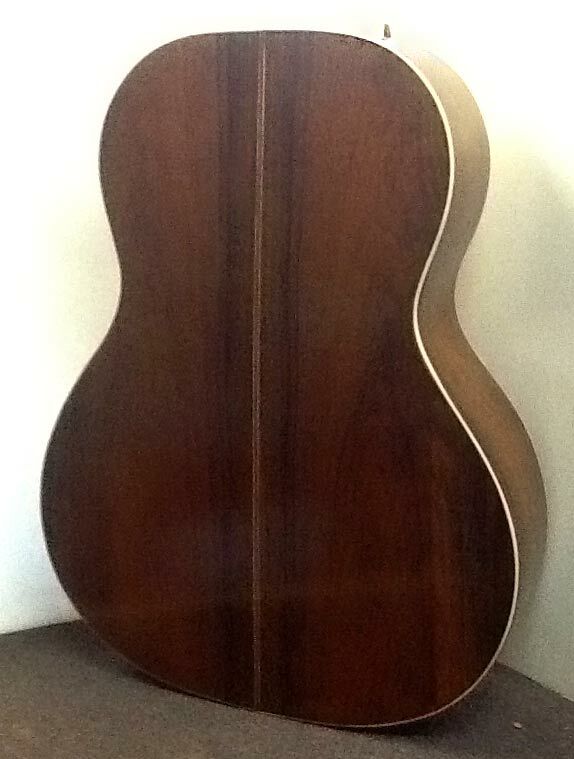 The instrument was well-made of Brazilian Rosewood (a rare commodity now) with good materials all around. It deserved respect. Stringed instrument with broken back on the driver’s side. You see a white wired LED light that Oola gave to Wildcard so he could see what’s going on inside. He could see that there were broken braces inside. At this stage Wildcard was involved with detective work: “How did this happen and how can I reverse the process?” “What are the weaknesses of the design and how much modification/reinforcement can I ethically do and still represent this as an antique?” So Wildcard sent some photos off to Gregg Miner of the Harpguitar Foundation. Gregg is a collector, player, promoter, scholar, and maven of Harp guitar — The guy to ask. And he said “It’s a Dahlman theorbo guitar, and it will be worth it.” The Wildcard explained to Oola that Theorbo means there are extra bass strings on the guitar. Wildcard didn’t know what would support the extra strings. He thought the brace might be made out of wood, but Gregg showed him that in reality a stainless steel tube was the historically correct replacement. Two head stocks? Uncentered, tilted to driver’s side, Chewed up inlay, broken binding. What the hayl IS that? In the middle of this repair, the Wildcard was called away to Port Angeles, Washington, to find a place for his new workshop. He found this space, a couple of blocks from the ferry to Victoria BC. 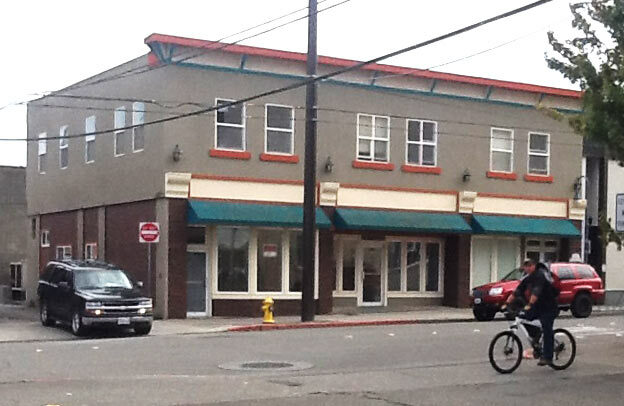 The bottom three lower windows on the left will be the new Wildcard Guitar pickin’ parlour. The three window cluster next to the center door will be Dove Studio. Once back in West Oakland, the Wildcard resumed his repair. 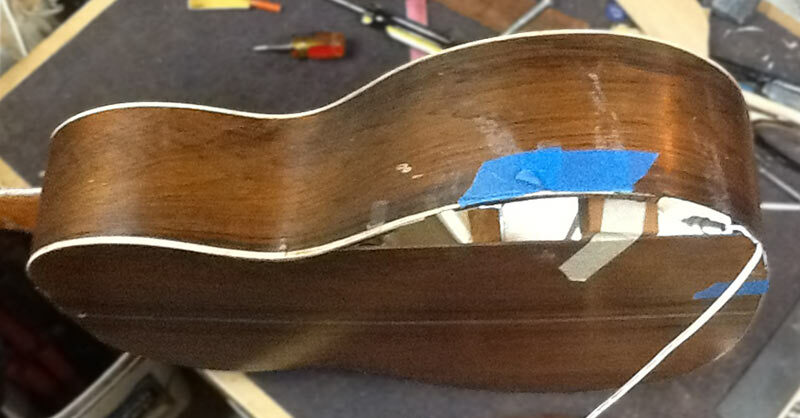 Here the broken pieces are replaced and glued, and the binding restored and replaced. Here it is with its stainless steel reinforcing tube. Here it is finished with strings, ready to play. Its sound has a shimmering quality because of the sympathetic bass strings. This is a guitar from the time of Debussy and the sound is reminiscent of the music of that period. 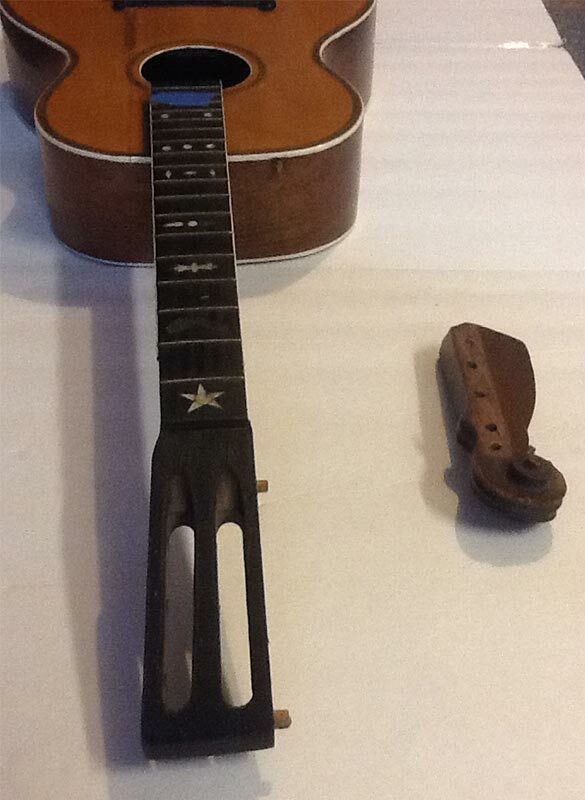 This instrument was used as the bass in the mandolin orchestras which were popular at the turn of the 20th century. Classical music was played on this type of instrument. Segovia played and recorded the same music on 6-string guitars. Segovia became famous because of the recordings. And today, Oola notes, most guitars are of the 6-string variety. Here’s Mickie Zekley, owner of Lark in the Morning. (The WildCard and I used to love visiting his shop of odd musical instruments in San Francisco.) 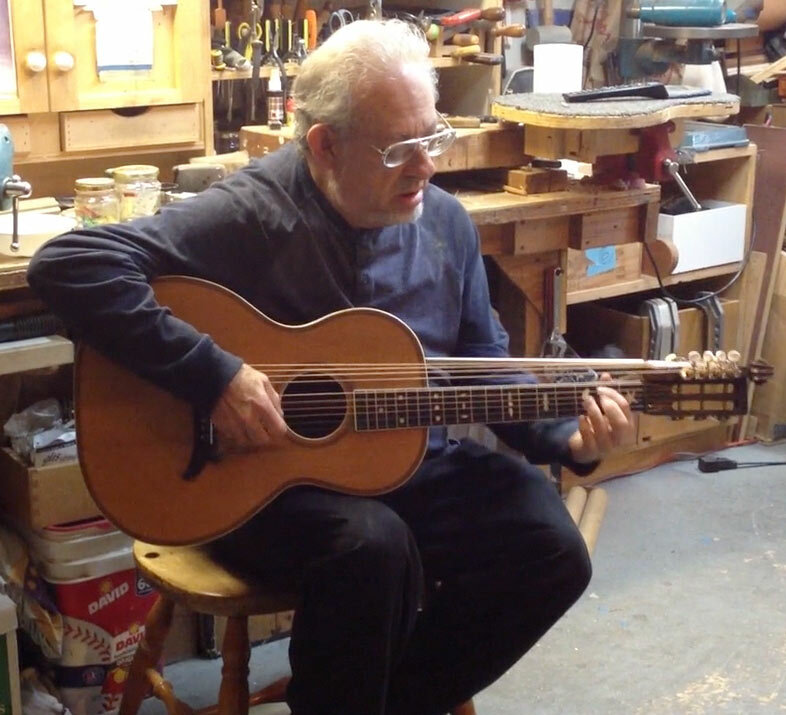 Here he is in the WildCard shop with his newly restored theorbo guitar. You can hear him playing 30 seconds of his own composition at https://vimeo.com/111315643. The clip gives a good idea of what this instrument sounds like. WOW…what a fantastic Road Trip. Thought I had seen just about every kind of guitar, but not this one. Mr Wildcard, you done did a great restoration!!!!!!!! Wonderful to take a trip in the middle to Port Angeles. A freakin’ great building to have your work and living spaces in. Are there any more like it? With Texas just having gone 100% Tea Party in regards to the top state positions, it is not a place to grow old in. Mickey Zekley playing at the end was a plus. He did not brush across the top four extra bass strings. Is is done at times, or are they totally for sympathetic vibrations as are the strings on Indian instruments? Reminds me of the old Gibson Harp Guitar, but I had friends who would actually brush the harp strings. Gary Davis, and Dave Von Ronk was there with a Gibson Harp, and he not only brushed the harp strings, but plucked them. The Rev. playing and shouting the words to “Twelve Gates to the City.” Excuse by going back to my 20’s, but some moments never are washed away by time. Love & Kisses to both of you. Wildcard wishes he had been in Rev. ‘Blind’ Gary Davis’s apartment with you! He also says that the difference between a theorbo guitar and a harp guitar is that the lower strings on the theorbo are tuned an octave below and are purely sympathetic, unlike a harp guitar wherein you pluck the bass strings.